HKS has developed the Super Sound Master and Metal Catalyzer simultaneously. 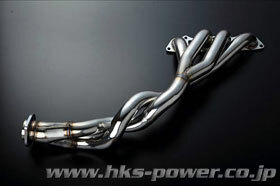 By setting HKS exhaust manifold the high potential S2000 drive powerfully and comfortably. This exhaust manifold does not sacrifice the torque characteristics at low to mid speed range. The layout is the same 4-2-1 type as the factory manifold. HKS' exhaust manifold is twisted at “2” to extend the pipe length allowing the torque improvement at mid speed range Knocking is also reduced, increasing ignition timing and air-fuel ratio for further performance and stability. Weight is 5kg less than the stock exhaust manifold.